I am such a fan of cream cheese especially around the breakfast table: bagels and smear, cream cheese danishes, cream cheese stuffed french toast… Oh, how my mouth is watering just thinking about it. 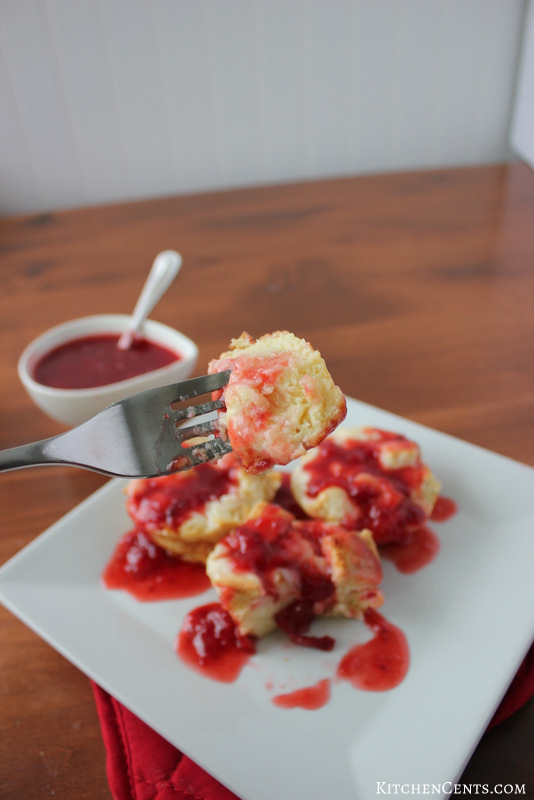 If you are a fan like me, these Cream Cheese French Toast Muffins topped with this 5-minute simple berry syrup need to be added to the list. They’re perfectly sweet and creamy and can even be made the night before. 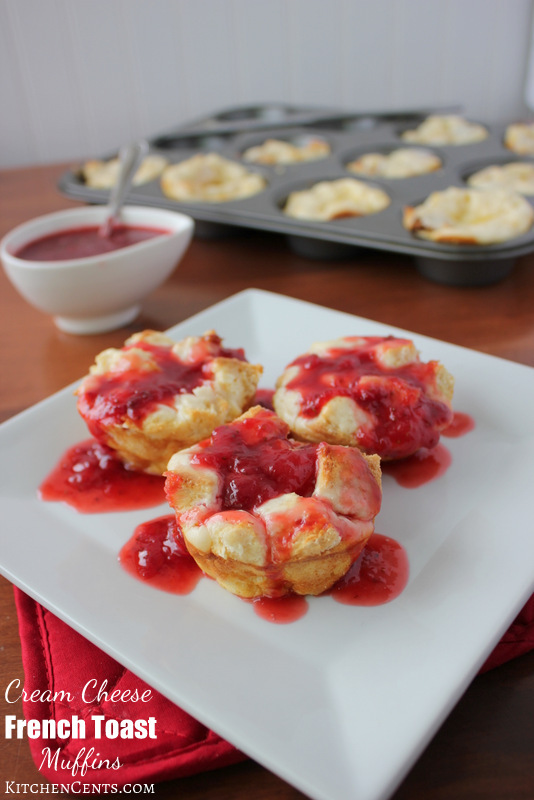 These muffins have a perfectly sweet cream cheese flavor that will be fancied by all that taste them especially with that gorgeous berry syrup. 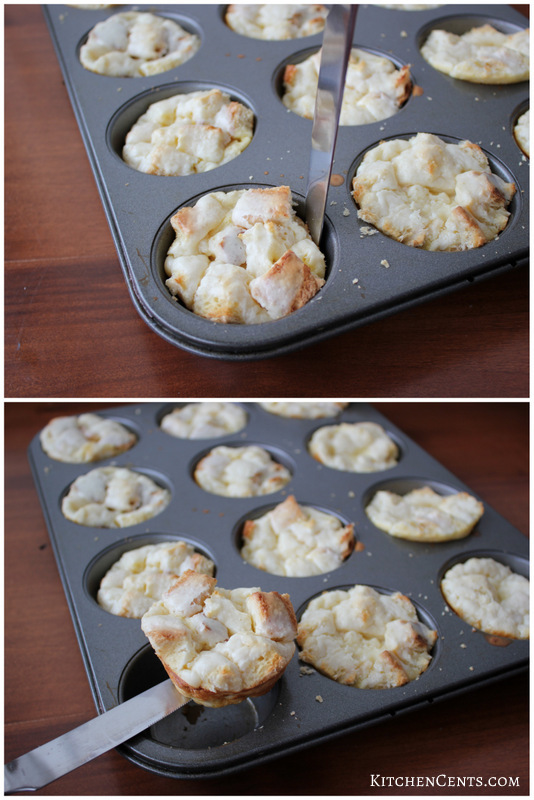 Back to these Cream Cheese French Toast Muffins. They are really easy to make and this berry syrup is even easier. For the muffin part here’s where we’ll start. Start by cubing the bread. If you plan to make this the night before, it’s best to use a crusty day old bread to avoid it going too soggy. 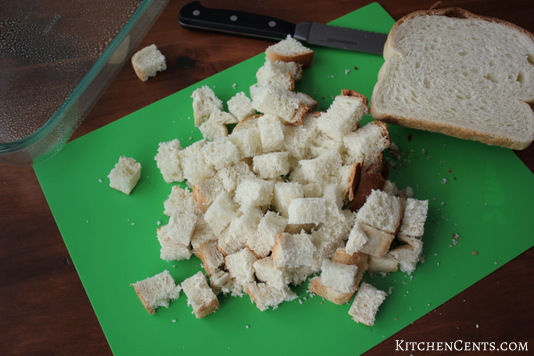 I like to get thick cut bread and do 1×1 inch cubes or so. Now for the cream cheese part. 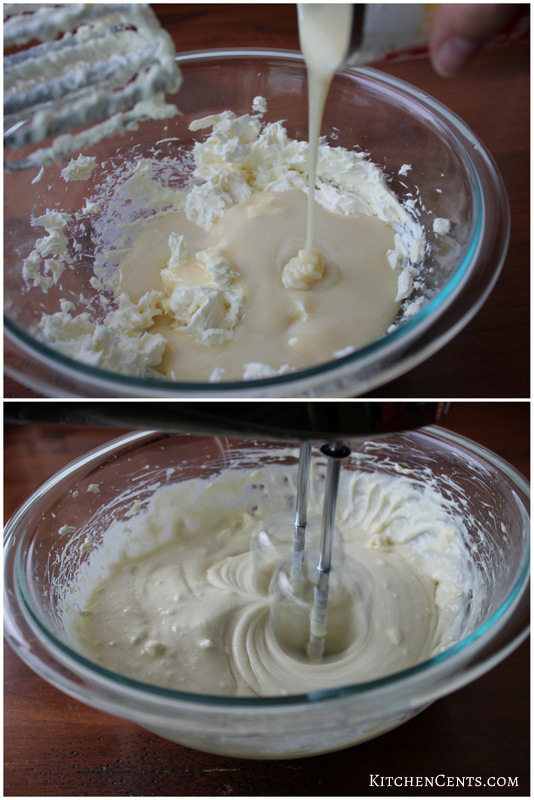 Make sure the cream cheese is room temperature otherwise it’s very hard to make this mixture smooth. 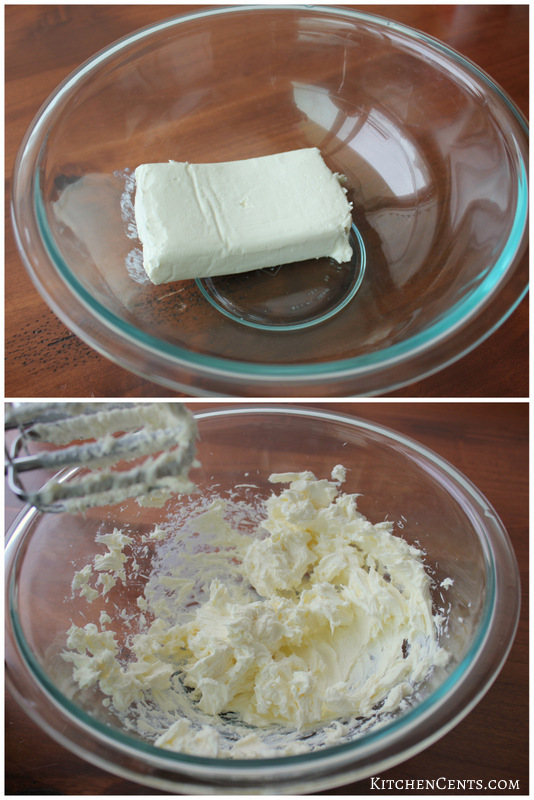 In a mixing bowl, using a hand mixer, whip the cream cheese for just a few seconds to break it up. This will also help the mixture become smooth more quickly. Next, add the sweetened condensed milk. Blend until smooth. 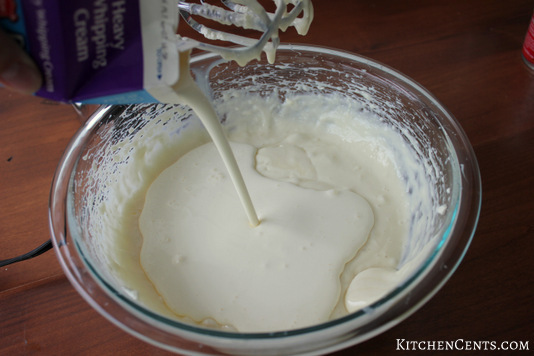 After the cheese mixture is smooth, pour in the cream. Mix again until blended. Once the cream cheese mixture is smooth, scoop out enough to fill the sweetened condensed milk can (that should be empty at this point). Set it aside. 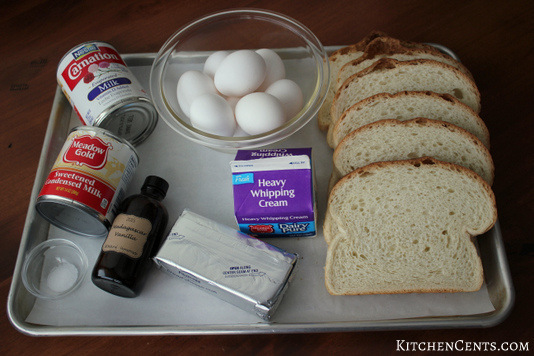 You will used the portion you’ve set aside to use as the cream cheese topping on each muffin before baking. 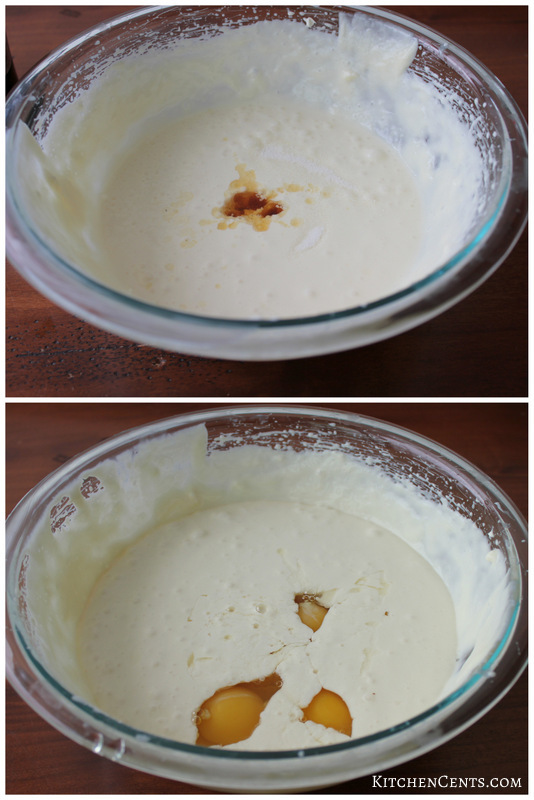 With the remainder cheese mixture that’s in the mixing bowl, add the vanilla, eggs and evaporated milk. 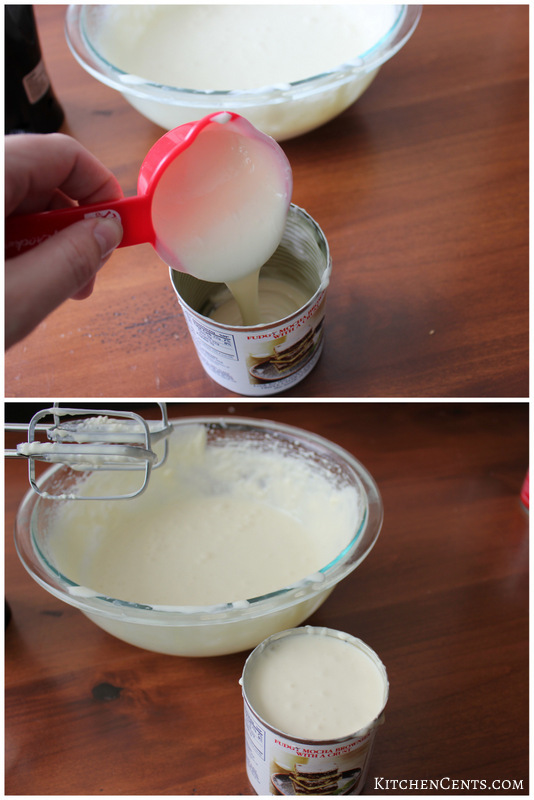 If you don’t have evaporated milk you can use 3/4 cup regular milk in place of it. I like using evaporated milk because it seems to be more creamy and rich but some people don’t prefer it. Blend the mixture until smooth. 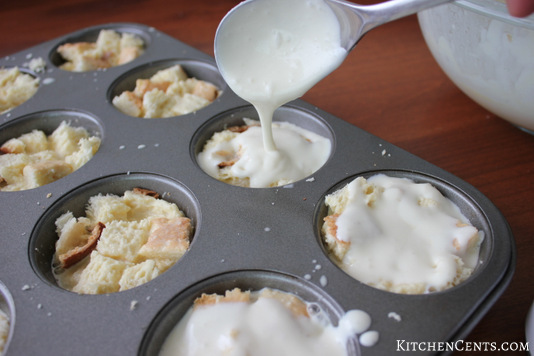 Now, using a pan spray, lightly spray your muffin tins. This will help to avoid sticking after baking. Fill each cup, to the top, with bread cubes. 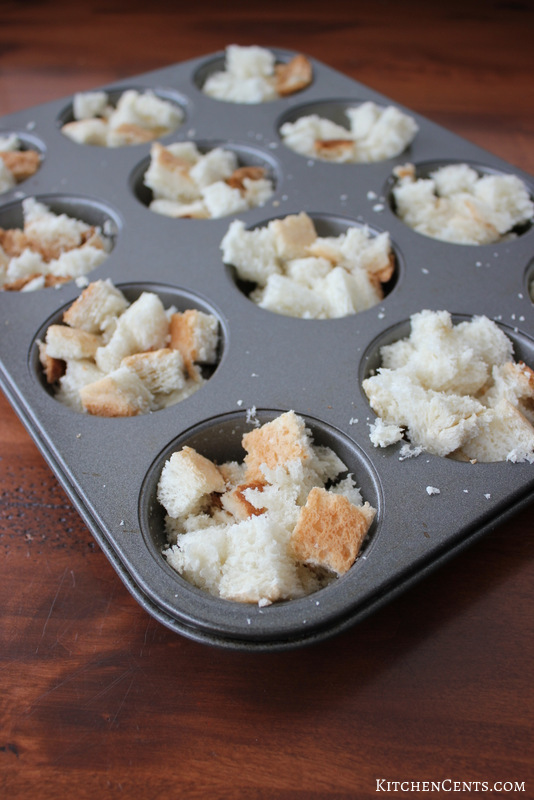 These little bread filled cups are ready for a nice creamy soak. Add about 1/4 cup of the egg mixture to each cup. You want the mixture to come about 2/3 to 3/4 the way up the cup. Lightly press bread into the mixture to enable full absorption. Make sure there’s enough room at the top to add the cream cheese topping layer without spillage. Add a large scoop, about 1-2 tablespoons, of the reserved cream cheese topping, that was set aside in the sweetened condensed milk can, to each muffin cup. Don’t they look so yummy already?! They are now ready for a heat wave in the oven. 350 degrees for about 20 minutes will do the trick. When they are done, they will be puffed up and the center should be set. 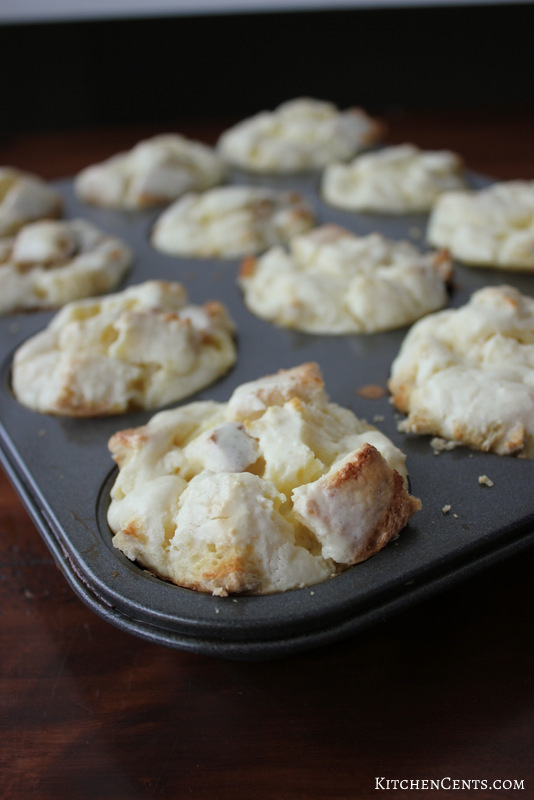 If you’d prefer a full bake style instead of muffins, make in a 9×13 inch pan instead of muffin tins. Bake at 350 degrees for 25-30 minutes until puffed and set. When these come out of the oven the air will release and the muffins (or bake) will “deflate.” That’s totally normal. 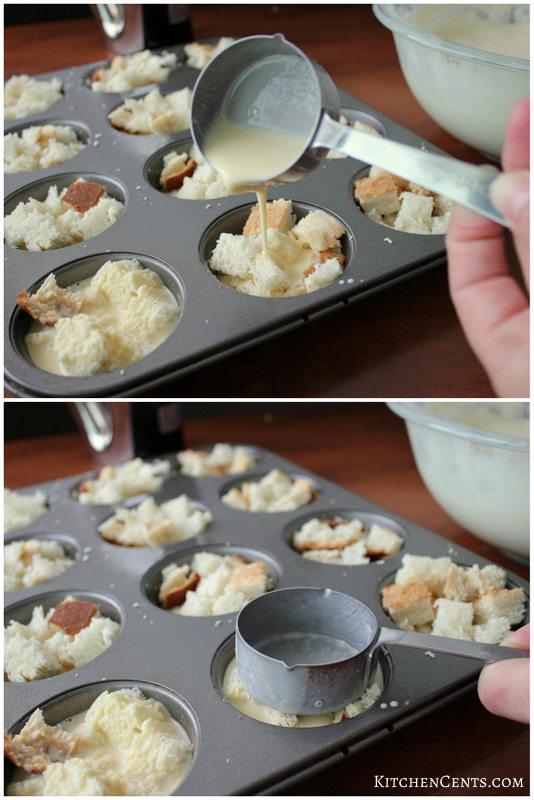 Using a butter knife, loosen the muffins and lift out. But even better with this 5-minute Simple Berry Syrup! Are you a cream cheese fan? 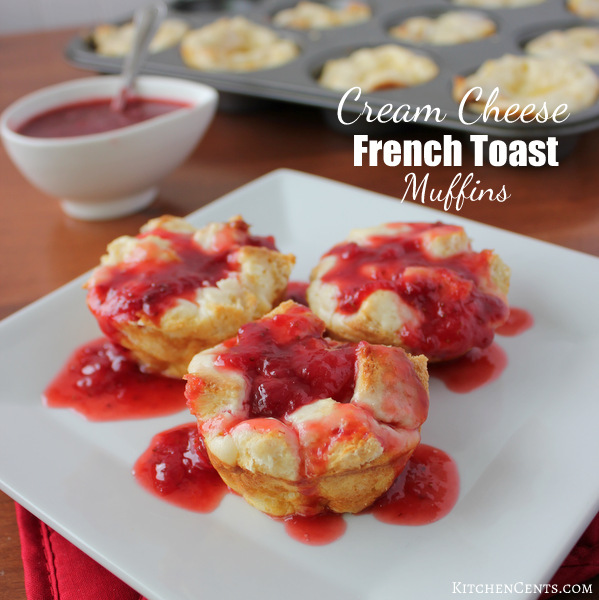 What would you serve with these cream cheese french toast muffins? 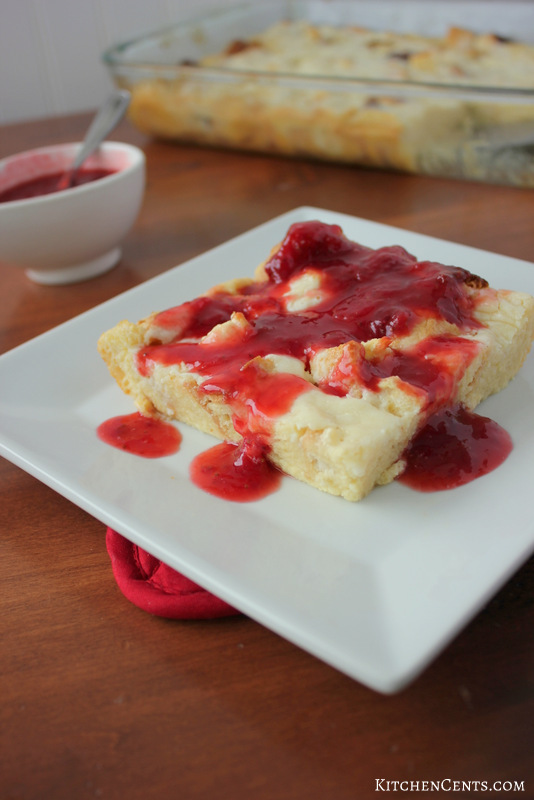 Looking for the 5-minute Simple Berry Syrup recipe?… find it here! Okay I am hungry now!! These look so good. I love cheese cake anything. Thanks Bella! I love all things cheesecake too! oh my gosh! These look incredible! The problem with them being muffin size is it means I can eat the whole pan in one sitting, right? These looks sooo good! Oh wow! That looks AMAZING!!! I have to try this at home! These look AH-MAZING! Gonna have to add these to a valentines day breakfast! My kiddo would love these! Thanks Megan. 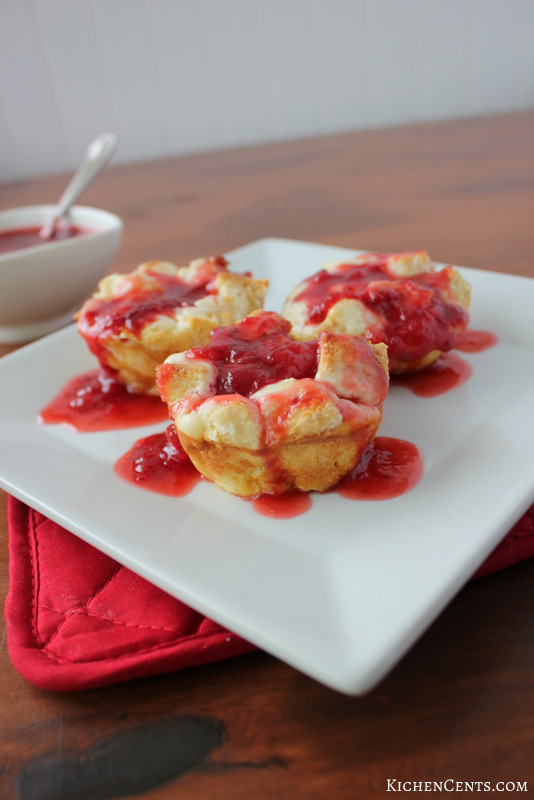 They will make a fabulous Valentine’s Day breakfast! Oh my goodness!! These look fantastic!! 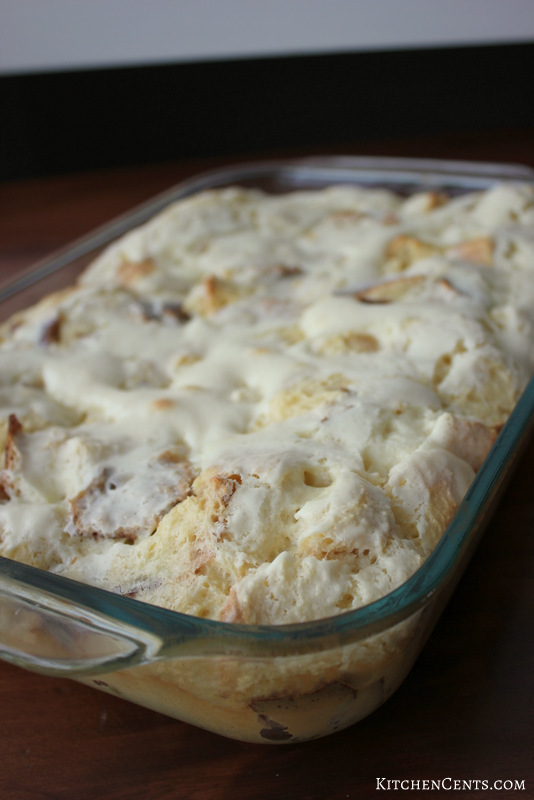 I love french toast, but now you are adding cream cheese… I am all about it! Thanks Jessica! They are as good (if not better) then they look. Now this is my kind of breakfast. I’m a fan of cream cheese. And french toast. And condensed milk haha! So this really is calling my name. Yum.